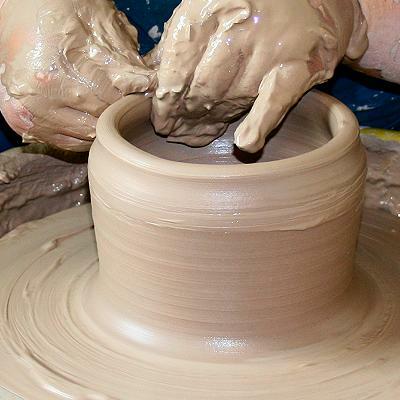 Jeremiah 18:4 But the pot he was shaping from the clay was marred in his hands; so the potter formed it into another pot, shaping it as seemed best to him. Greetings to all my beloved readers….Blessings! The University of London cannot give you the revelation of Jesus. You need to sit in the presence of the Lord because flesh and blood cannot portray Jesus in you, but Father in heaven must reveal the son to you. Now you may think who this vessel is and who is this great potter? Do not be amazed!! This vessel is you and me and the great potter is our Lord Jesus Christ. There are many potters in the world who can design and mold vessels made of clay, but they cannot mould people and their hearts…But my great potter is great because he can mold you inside out. The art of making a pot has not changed through the centuries. The wheel is now turned by an electric motor, but that is about the only difference. Even this is still controlled by the foot of the potter. The clay is the same as it has always been. The potter is the same,with his capable hands, guided by his intelligence, working to mould and shape the clay into the vessel he has in mind. All glory to God. I remember when I had shared this message in my church, I was crying like a child….I couldn’t stop my cry because I was totally marred. But I could see that my Great potter was holding me and was molding me into a new vessel. I burst out into tears when I saw that revelation …I was marred and totally messed up but still, he did not throw or cast me out… He still wanted to mold me into a new vessel… I love my Jesus…because He remembered me… He molded me into a new vessel. I give all glory to my father in heaven. remember, we are on the wheel the potter is having full control on our life and he is making us. great potter- Jesus Christ. You are in his hands because he has a great plan over you. How much strain Jesus took for mending our lives which were under darkness! He left his heavenly glory and came humbly to this world and kept silent in front of authorities who were putting false accusations on him. He bore our sins till the cross. One night while I was praying, I saw two nailed hands clearly coming towards me. That time, the Holy Spirit spoke to me about how much strain Jesus took for us and I started writing it on my dairy with tears in my eyes. “I had nailed those hands that formed me. I had nailed those hands that drew me out from the pit. I had nailed those hands that molded me – The hands of my daddy –Jesus Christ”. Dear Reader, how many times you and me were marred? God always begin a work in us, but by our unfaithfulness and our weakness, we get marred completely. Just see the face of potter. You and I are in his hands, but is the potter glad by seeing you? Is he satisfied by seeing you and me? Are we totally messed up in our life? Marred in his sight? Remember, there was a lot of strain behind you and me …He shed his blood for us. The Roman soldiers pierced him until the last drop of blood, and he laid his life for you and me. Why did he lay his life for us and why he left the glory and came humbly to the world? Have you ever thought of this? We were formless because of sin, and wages of sin was death but Jesus laid his life so that you and I may receive life, an abundant life. He became formless so that he may give you his form. Are you the one who is totally messed up in your life and thinking that there is no hope left in me and that even God has forsaken me? Wake up! You are in the hands of the great potter. He will mould you into a different vessel. He will take all you’re messed up situations which you can’t clear up. He will take them for you and mold you in his hands into a new vessel, Jesus said in Cana of Galilee to fill the empty Jars. And that empty Jar was filled with the water and Jesus changed the nature of water into wine which satisfied everyone. He is ready to fill and change your empty places but are you available? The Bible in Romans 8:28 says, “And we know that all things work together for good to them that love God, to them who are the called according to his purpose.” The verse does not say that “all things are good” but “all things work together for good.” Cake illustration: There are many ingredients that go in to making a cake, and many of these, if taken by themselves are not good tasting (i.e. not everyone enjoys eating raw eggs, or flour etc.) but if you put all of the ingredients together, they all work together to make a great tasting cake (the end product). So God takes the bitter and sweet, the hard and easy, the bad and the good, and works them all together for good. It may be your family life that is messed up or may be your personal life which is marred, but give it unto the hands of the great potter. He only can mold you and heal you. Peter once left Jesus and went fishing. Fishing is not a sin but his hope and faith on Jesus were marred,but Jesus approached him and made him into a new vessel, and when this new vessel stood up in the day of Pentecost, he spoke the Word and on that day, 3000 people were added to the church. If the vessel is spoiled, it is good for nothing but our great potter does not throw the marred clay. Instead, he takes it and moulds the clay into another shape. God knows you and he knows how much you are marred in your life humble yourself into his hands he will make you into a new vessel with a new beginning. Out of the 100 sheep, one was lost but the good shepherd left that 99 aside and went searching for the lost and took the lost sheep in his shoulder …are you in his hands ?? Jesus is searching you dear brother and dear sister! Are you messed up? Humble yourselves under the mighty hands of God and he will exalt you in due time.